I haven’t written any fashion blog posts for a while, not really since my stint as a fashion columnist at University and my half hearted attempt at a bargain fashion blog during the same era. Turns out it wasn’t my forte. Despite this, on Monday we launched an exciting fashion collaboration, and when I say we, yes I’m referring to IBM and so I just had to share it with you all! On Monday evening, New York was host to the Met Gala, the annual fundraiser for the Metropolitan Museum of Art. Each yearly event is tied to the year’s Costume Institute exhibition, and guests are expected to choose their fashion in line with the exhibition theme. The theme this year is “Manus x Machina: Fashion in the Age of Technology” – an ideal opportunity for IBM to make waves in the fashion industry! But how on earth would we do that I hear you say! Doesn’t IBM just make computers? IBM’s Watson technology is a cognitive system which enables computers to work more effectively with humans – remove all those weird robot taking over the world ideas from your mind right now. We’ve been teaching Watson about all sorts of industries to help professionals make better decisions in healthcare, banking and even cooking. The technology understands, reasons and learns continually through natural language processing, with all types of data, including images and tweets. For example, we’ve fed Watson all the research ever conducted on Cancer, more than any one person could ever read, and now this technology is being used in Cancer research to identify patterns and trends to help healthcare professionals make better decisions in this area for their patients. For this collaboration with Marchesa, cognitive was present in each stage of the creative process, from concept and R&D to the finished item. 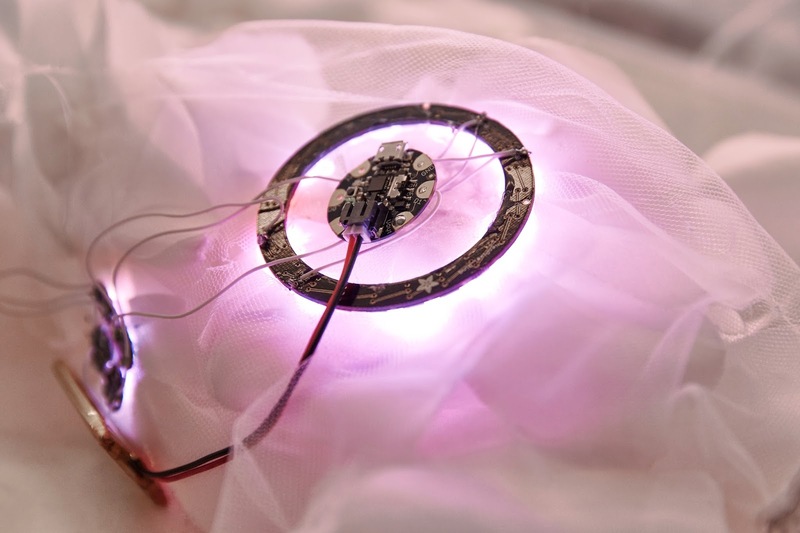 The dress’creation relied on a number of Watson APIs (application program interfaces), tools from IBM Research, input from Partners such as Inno360 and the creative input from Marchesa themselves. A dress that learns from hundreds of images – having fed Watson hundreds of images of previous Marchesa designs and brand imagery the team were able to identify a colour scheme that reflected Marchesa brand values and triggers emotions that the designers want to inspire. A dress that reasons with data – having finalised the colours, Marchesa worked with IBM partner Inno360 to help identify the material that suited the criteria and still represented the Marchesa brand. A dress that understands its fans – in true cognitive style, Watson Tone Analyser was linked to the LED lights in the dress enabling it to change colour in real-time depending on the sentiment and conversation on twitter surrounding the Met Gala. As an IBMer and Marketer, this project is very exciting for me. I want to push the boundaries of what and where we can embed our technology, in particular cognitive. With the ability to analyse structured (numbers) and unstructured data (imagery/written text), the opportunities for our reach are developing every day. You might have seen some of the more recent examples of Watson analysing characters in Harry Potter, Star Wars & Game of Thrones? If not, they’re well worth checking out to get another angle on this tech. I’m hoping this isn’t the end of our fashion designer persona and more…watch this space!